After a disastrous eight months, in which we have drifted badly off course under Ian Cathro, Hearts now need to break from their favoured approach of operating with a young head coach under the director of football and ensure an experienced manager with full autonomy for first-team matters is appointed. With that in mind, I’d urge the club to get straight on the phone to Stuart McCall and try and bring he and his trusty right-hand man Kenny Black to Tynecastle. Derek McInnes also holds plenty appeal, but he’s probably out of our league at the minute, while I also like the credentials of Tommy Wright and Alan Archibald. I don’t think any of these managers I’ve named – all of whom are proven at Scottish Premiership level – would take the job in its current form, but if there was a change in the club’s approach, whereby any new man would have the chance to bring in his own assistant and have total control of all first-team affairs, then it would certainly be a job that would appeal to many. Yes, Kenny Black is a close personal friend of mine, but I genuinely feel that he and Stuart would be the best-suited management team we could realistically target at this point in time. Their record at Motherwell in particular was excellent as they had a team with a fraction of Hearts’ resources routinely in Europe while playing exciting attacking football over several years. They have also had experience of managing bigger clubs in the form of Rangers and Bradford City, who still draw crowds around 20,000. Stuart’s a hero at Bradford, so whether he’d want to leave there is another matter, but I’d certainly be asking the question if I was on the Hearts board. In addition, Kenny knows what Hearts are all about and has worked closely with Craig Levein, both as a former team-mate at Tynecastle and as a coach under him at both Leicester and Scotland, so I think it makes sense on so many levels. Whatever way we turn, however, we are at a stage in our rebuilding where we simply cannot afford to take another major risk – we need to go for a relatively safe pair of hands. Despite our recent struggles on the field, the club is still burgeoning off the pitch. We have the new stand going up and supporters are still flocking to buy season-tickets. In Scottish football terms, we are a huge club with so much potential if we can get things right across the board. In recent times, though, it has felt like we have been operating with absolutely no leadership on the football side. We need a strong figurehead to go in there and inject some life, passion and backbone into the team because we have become one of the softest touches in the country lately. That, for me, is largely down to the current structure we have in place. Heart of Midlothian don’t need a rookie head coach – this club needs a manager who has total autonomy and the full respect of the first-team changing room. The current set-up worked well enough when we first got Robbie Neilson in because, at that point, Robbie only had a small amount of coaching experience with East Fife and Hearts Under-20s, and would have been thrilled just to be asked to take charge of Hearts, no matter what structure was in place. In addition, as a former captain of Hearts, he had a good knowledge of the pressure and expectation around the club. It was notable, however, that, as his stock rose, and as soon as an English League One side came calling, he jumped at the chance to leave. For me, the club could have made more effort to try and keep Robbie, but Craig had obviously decided that Ian Cathro was the next big thing and would make an adequate replacement. The blunt truth, however, is that the appointment has proven to be totally flawed and that Ian was miles out of his depth. I sympathise with him – I’ve been there myself and it’s a horrible feeling to lose your job. It wasn’t nice to see what people were saying when Ian first got the job, but, with the benefit of hindsight, I can totally understand why I lot of it was said. 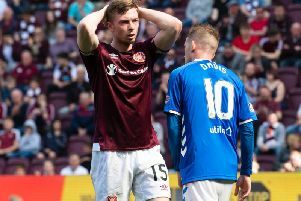 Regardless of any perceived talent on the training pitch, it became pretty clear early on that he doesn’t have the required stature, certainly at this stage of his career, to command the changing room at a club the size of Hearts. From the outside looking in, the signs were there after the abject response we got to the Hibs defeat in February that we had gone down the wrong road. I’m glad we’re making the change before our league campaign kicks off, but I made my doubts clear towards the end of last season and I think we could have acted earlier, before our Betfred Cup hopes were dashed. Everyone knows myself and Craig Levein don’t get on, but regardless of that, the director of football has to be held accountable for what has gone on at this football club over the last eight months – it has been unacceptable. To use a dental analogy, I feel like we’ve started to deal with the nerve problem within the tooth by removing the head coach, but we need to get to the root of the whole problem, which surrounds the structure we have been operating with. I have no problem with the director of football being in place and working behind the scenes, discussing youth development and potential signing targets with a manager. But ultimately I want a football manager who everyone knows is fully responsible for all matters concerning the first team. I think all players and supporters want to know exactly who is in charge, and for as long as we have an experienced director of football operating with an inexperienced head coach, who is learning on the job, there will always be doubts in people’s heads. Having an experienced figurehead like Stuart McCall or Tommy Wright leading Hearts into the new campaign would go a long way to banishing the concerns many of us have over the current structure.